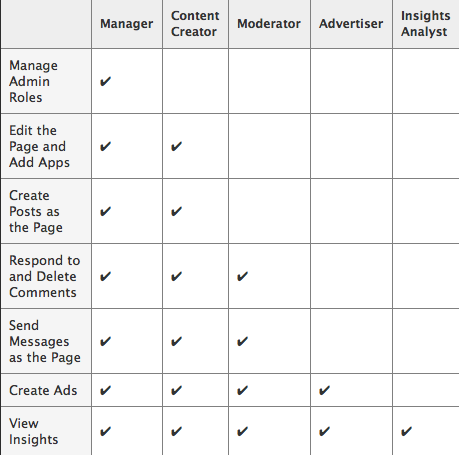 Facebook Gives Granularity to Page Admin Roles: Businesses with Facebook Pages can now set five different roles for their admins: Manager, Content Creator, Moderator, Advertiser and Insights Analyst. This is a useful tool for Facebook managers. Businesses on Facebook can now grant page admins varying degrees of permissions, depending on their role. "You can schedule a post up to 6 months in advance in 15-minute intervals," and you can also "choose a date in the past" and your post will appear at the appropriate place on your Page's Timeline. How will the switch to Google+ Local impact your business? Has anyone tried the new Facebook Promoted Posts? Share your comments on ghost writing for blogs. Facebook Rolls Out Promoted Posts for Facebook Pages: “Promoted posts are a simple way to reach more of the people who like your Page and their friends.” Promoted Posts give your updates more exposure on Facebook. 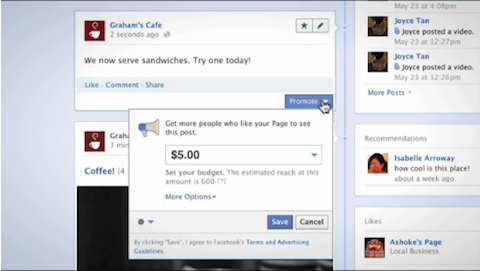 To promote a post, select the Promote button after creating an update on your Page. Google+ Local Replaces Google Places: “Each place you see in Google+ Local will now be scored using Zagat’s 30-point scale, which tells you all about the various aspects of a place so you can make the best decisions.” Google Place pages have been automatically converted into Google+ Local pages. This is Google’s first step beyond Google Places. 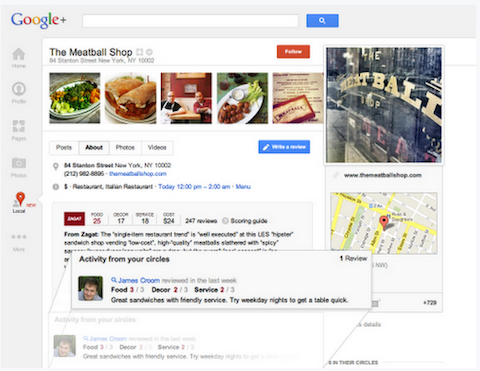 Google+ users can see the different scores others give this restaurant. Bit.ly Gets New Look: The new design features “make it easier and faster to find and share interesting stuff.” Things have moved around a bit, so if you’re looking for something specific, check their Knowledge Base for directions. 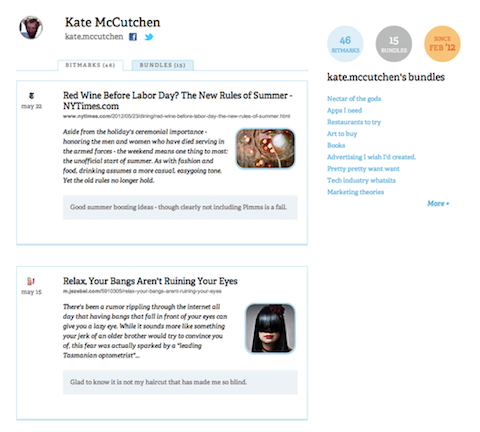 Check out Bit.ly's new bookmarking feature, the Bitmark. 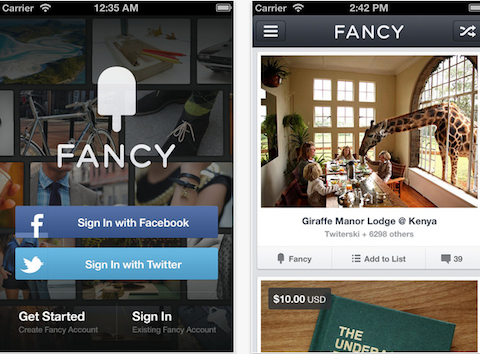 Pinterest Rival Fancy Brings Social Commerce to iPhone: The Fancy iPhone app allows people to browse the cool products shared on Fancy and also purchase items directly through their mobile devices. Fancy has nearly one million users who press the Fancy button 3 million times every week. 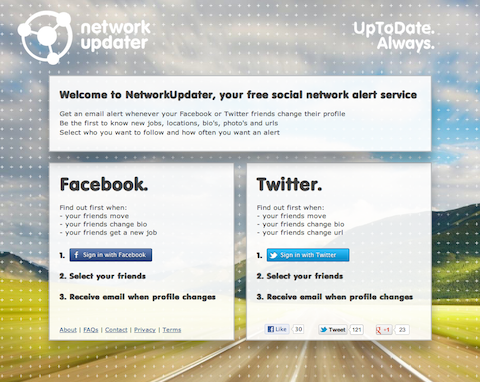 Network Updater: A free social network alert service that sends you email alerts for any changes or updates from the Twitter and Facebook friends you select. Network Updater ensures you don't miss the news from the people who matter most to you. Curalate: A paid monitoring and analytics Pinterest tool for both the activity on your Pinterest account and all of the pinning activity from your own website. What social media news caught your interest this week? Please share your comments below.